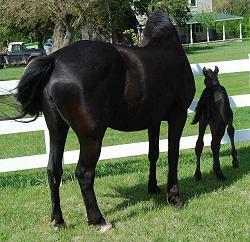 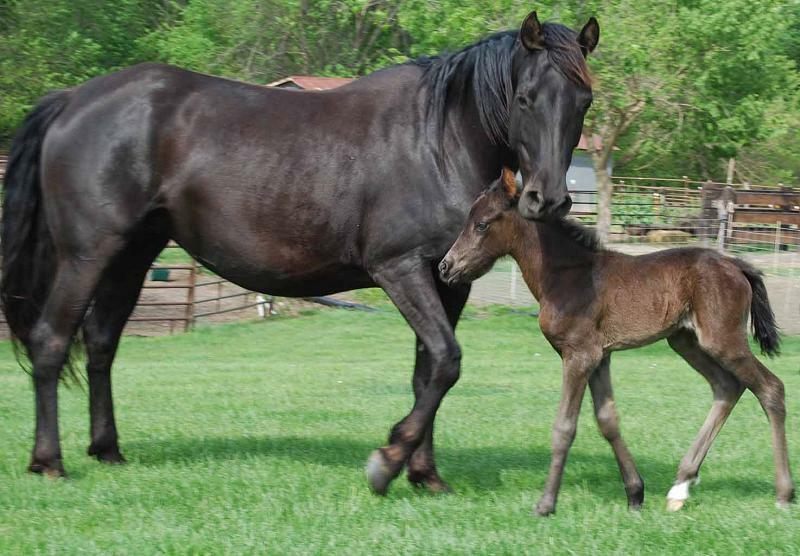 Ryder pictured at 7 days of age with his dam, B Mine. Ryder has a blaze just like his dam. 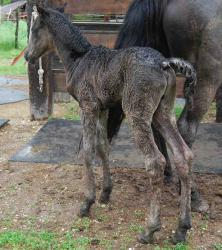 We will soon know if he will shed off his light coat and turn into a dark red jewel like his dam. 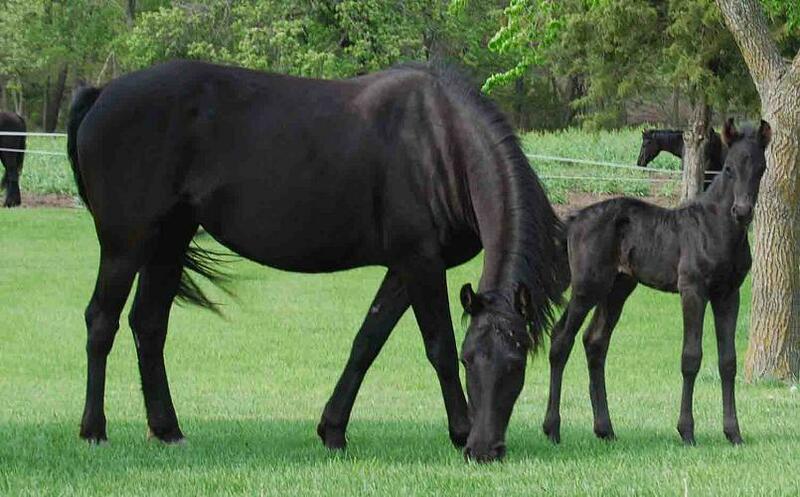 I love his dam's color. 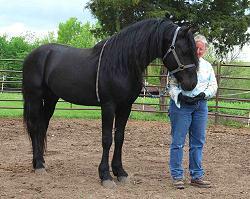 coupled with the baroque curves and prettiness of his sire. Red Ryder B, pictured at three weeks of age is displaying the calmness and patience of an older animal tied. Even at a young age Ryder is learning the lessons of life; patience and discipline. 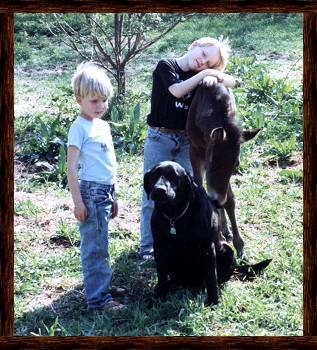 He will remember these lessons throughout his life and these lessons will become his building blocks to a strong foundation as he matures. 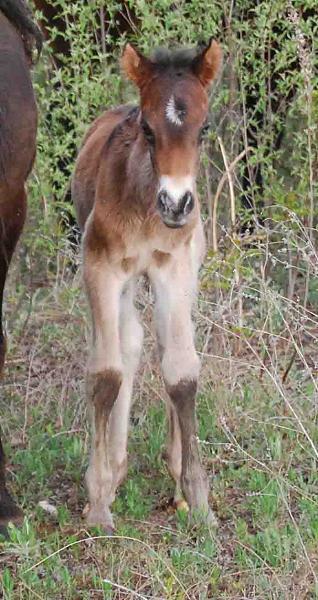 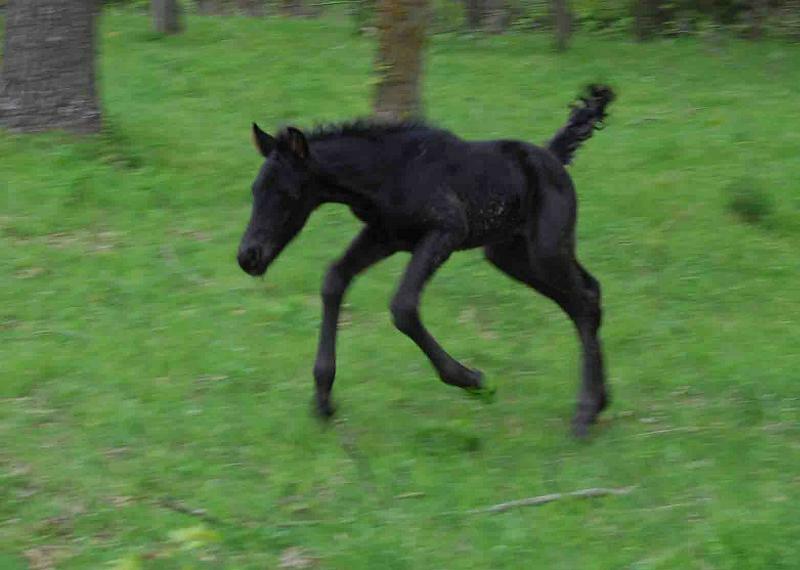 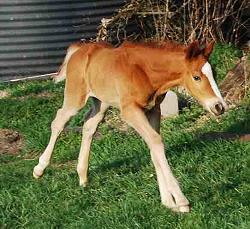 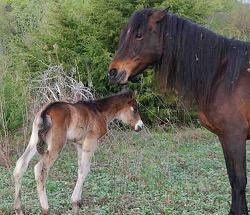 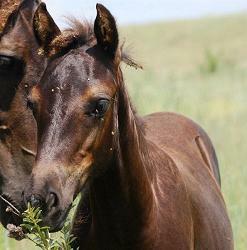 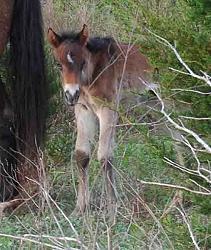 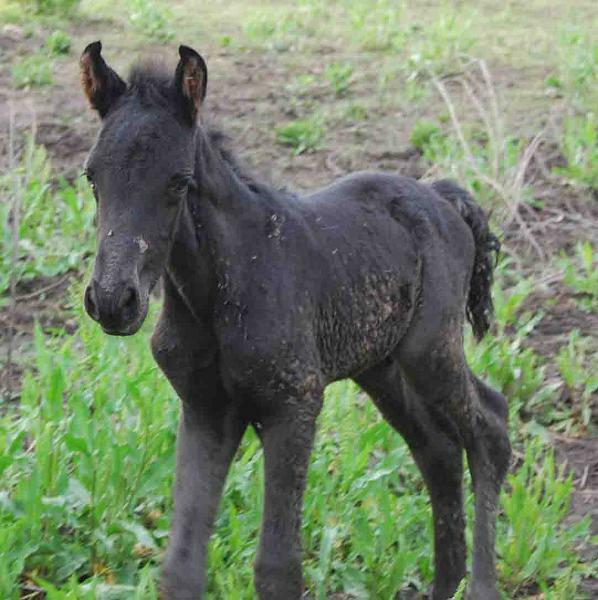 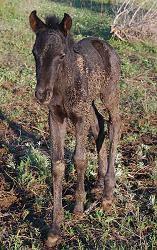 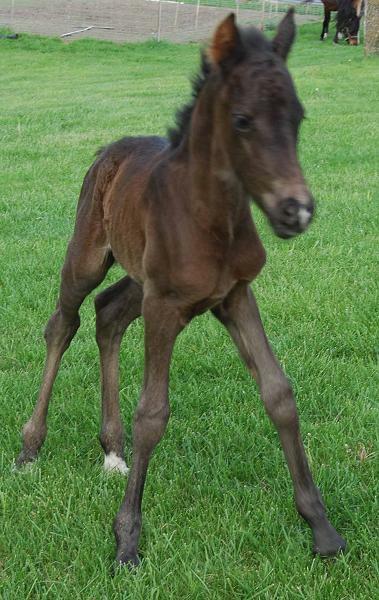 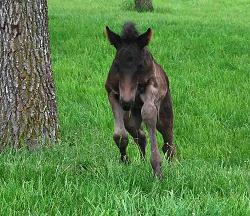 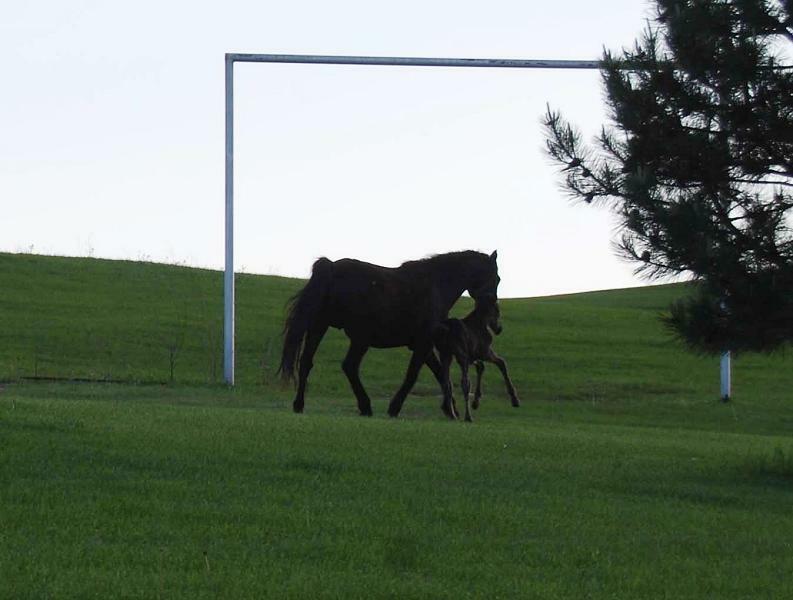 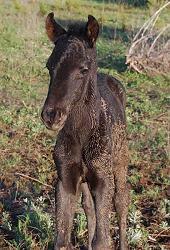 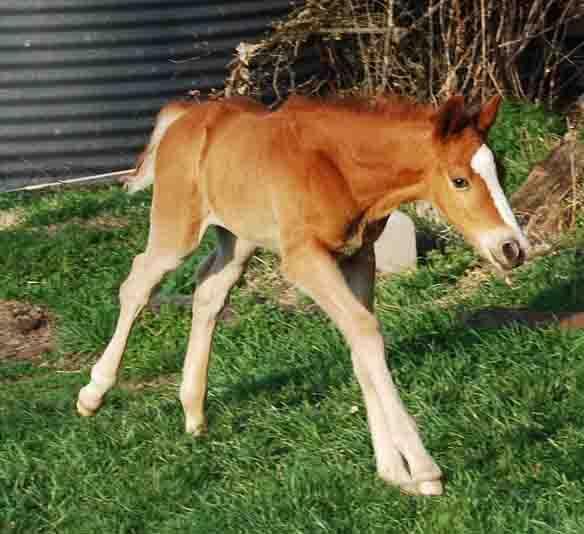 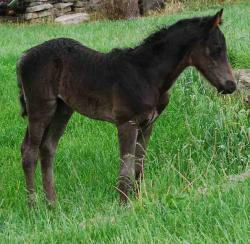 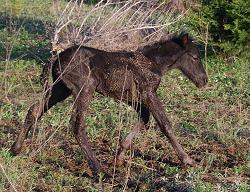 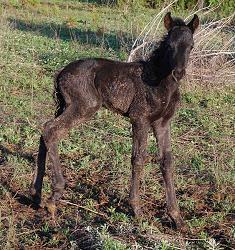 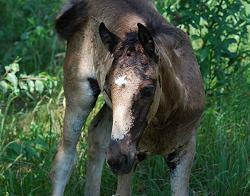 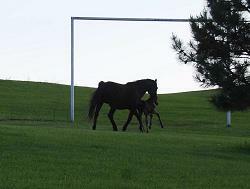 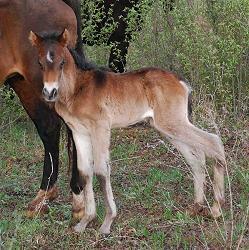 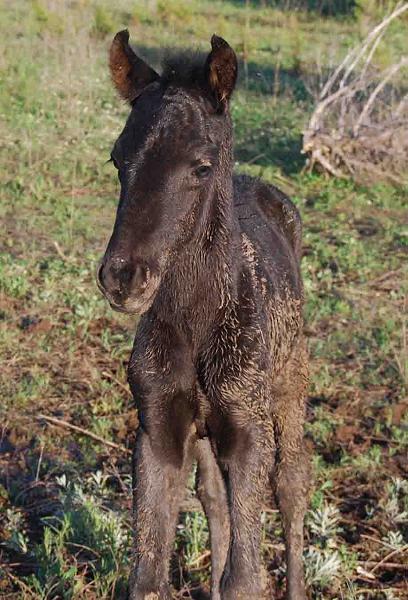 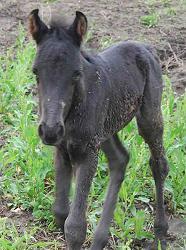 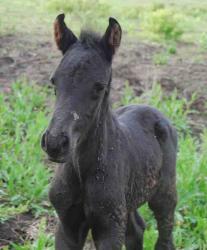 The colt is a few hours old and beginning to learn the lessons of life. His first encounter with water and first water crossing. 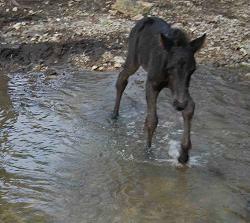 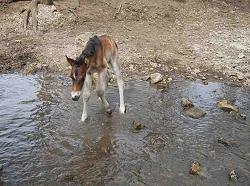 Lucky for the foal the creek is down making the crossing easy. Even though he is only hours old he will remember the lessons he is learning today. ~ At the water crossing Freedom decides to have a little fun. 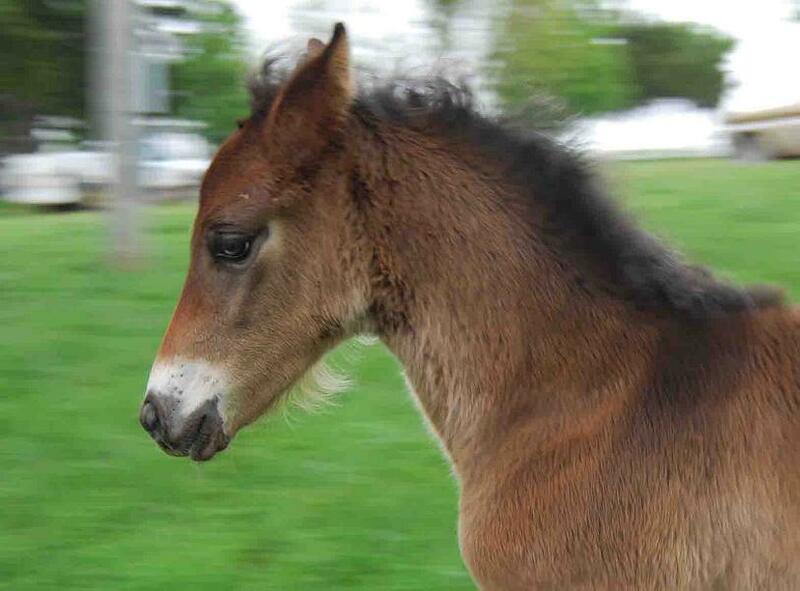 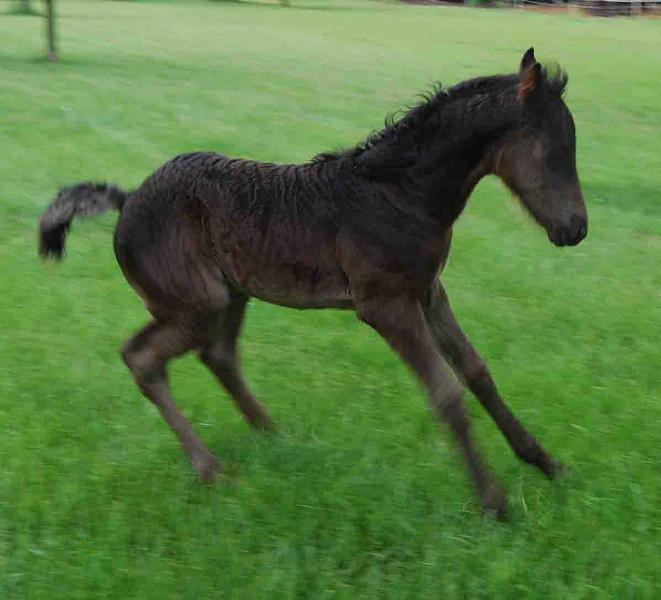 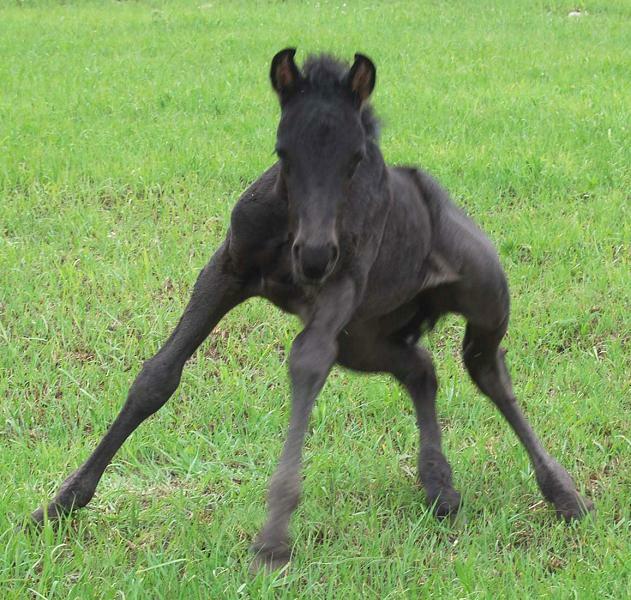 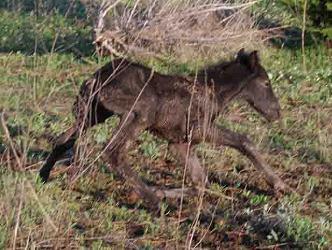 When new foals are born within the herd it is a exciting event for the entire herd. 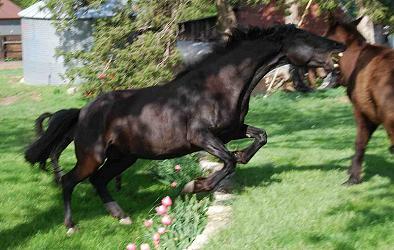 It is a jubilation; an event worthy of great celebration. 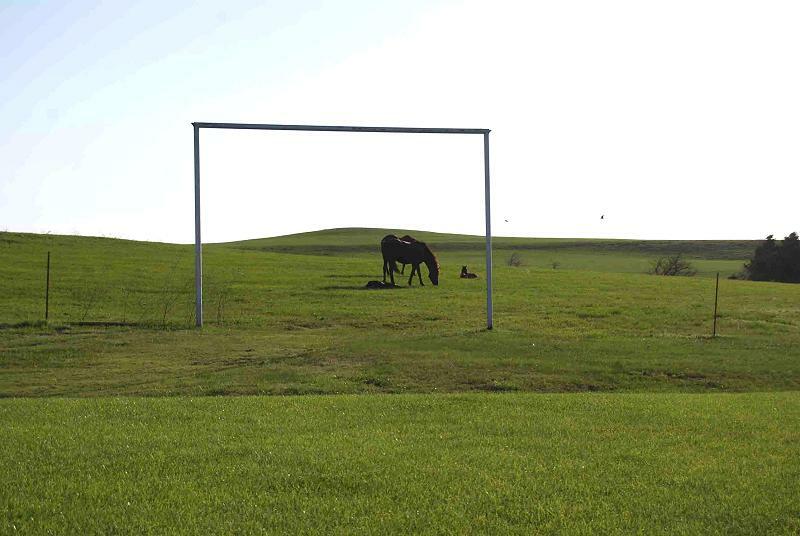 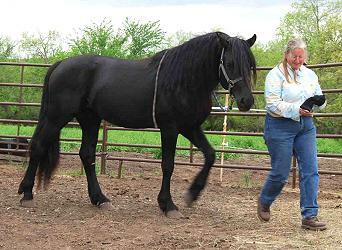 The horses prance and dance around to express their emotions. All of them carry around a twinkle in their eye and all join in the celebration of “life”. 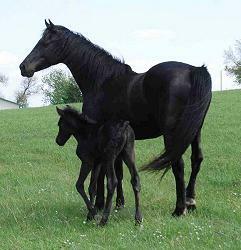 When they get to close to “Mom” she lets them know. She guards her perimeter. 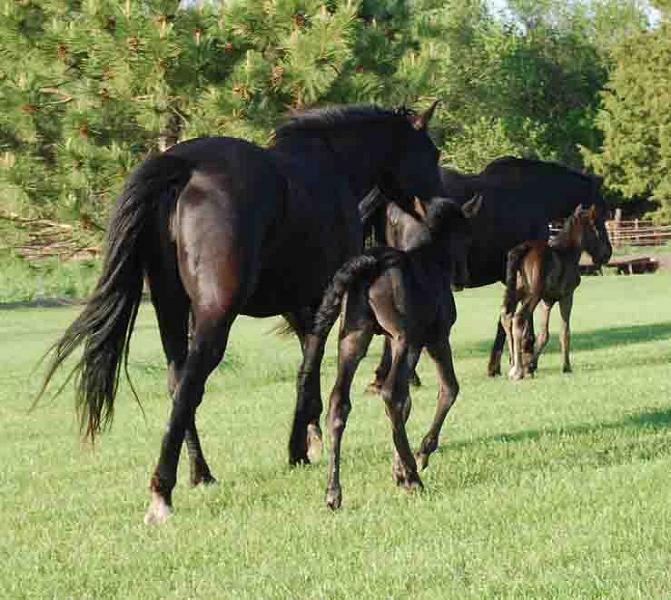 They in turn guard her perimeter from any outside intruders. 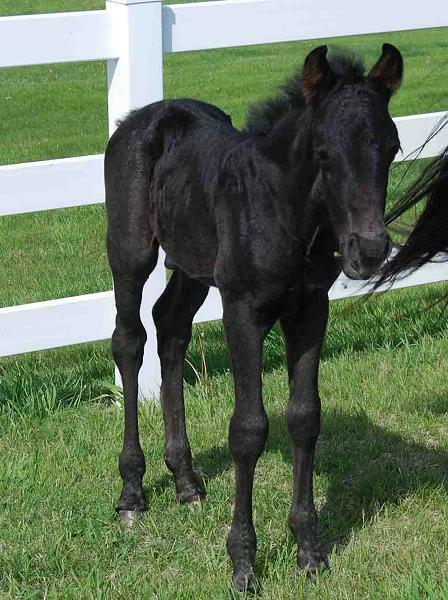 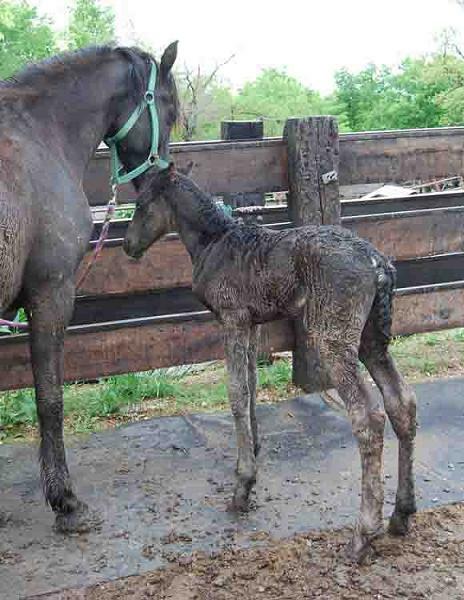 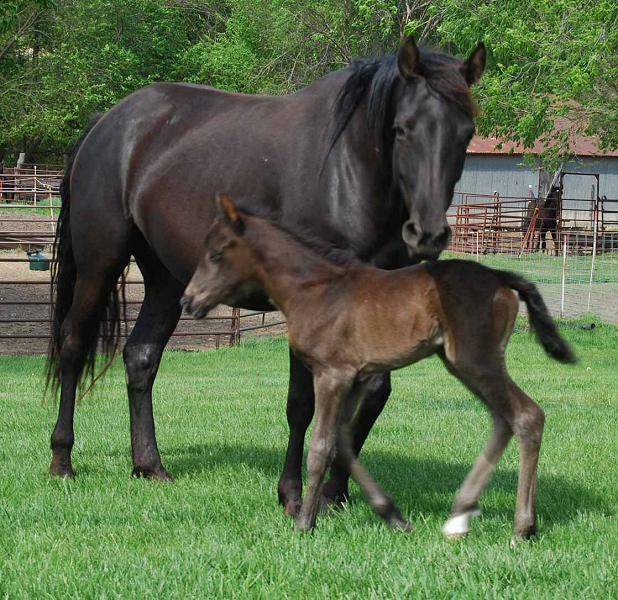 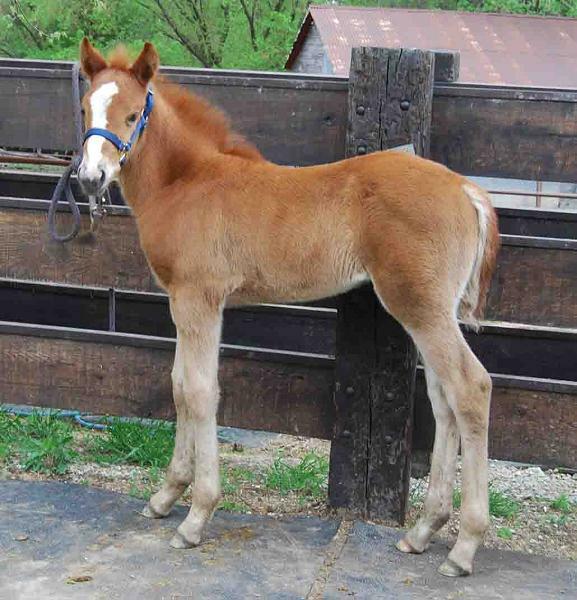 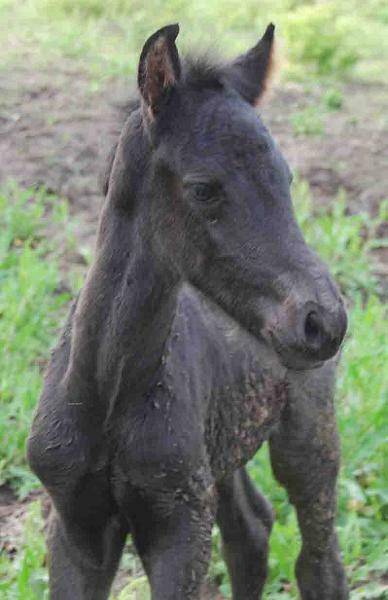 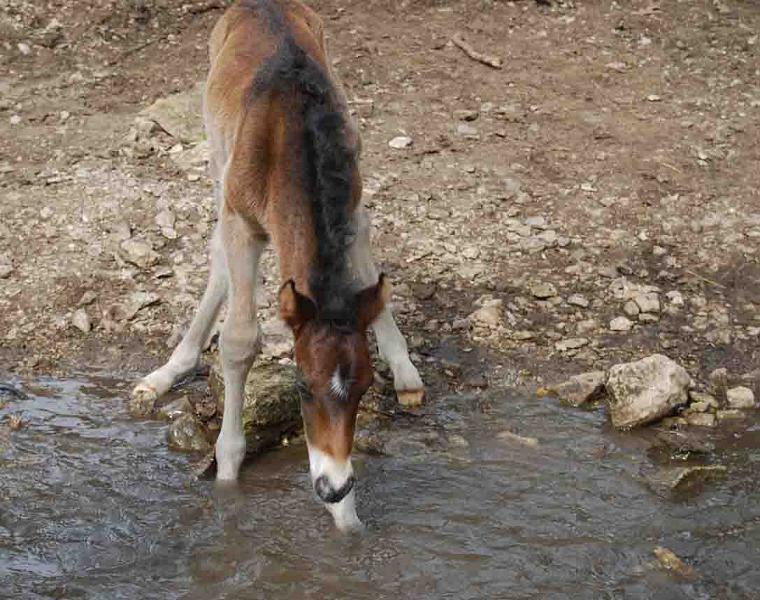 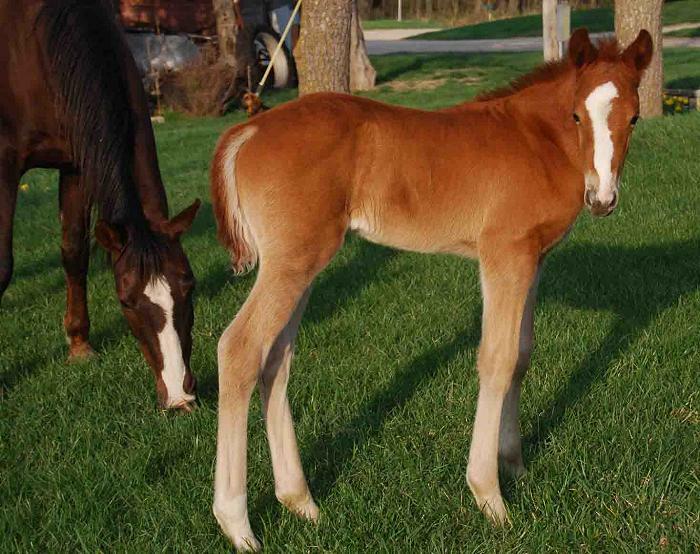 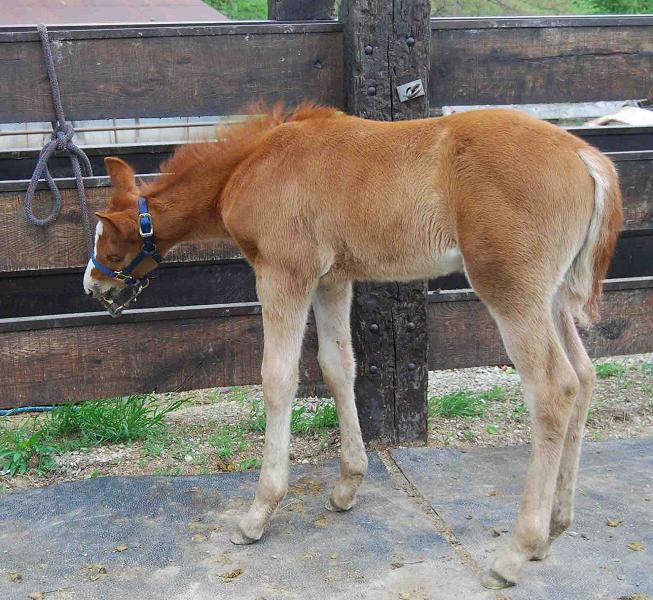 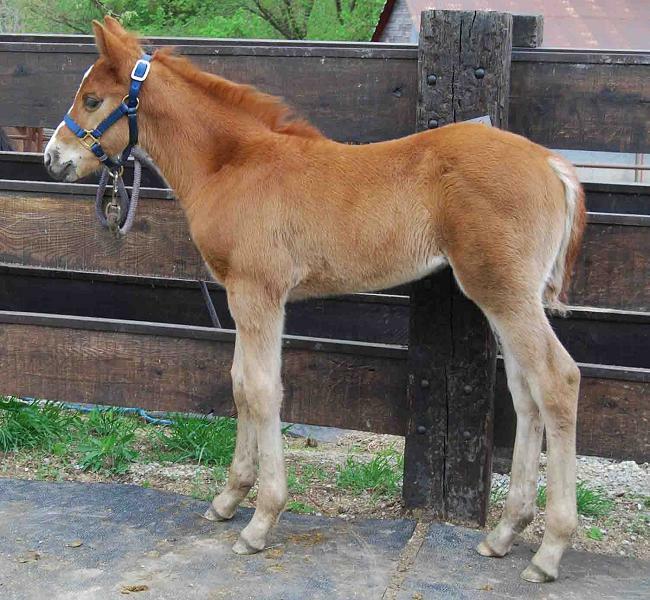 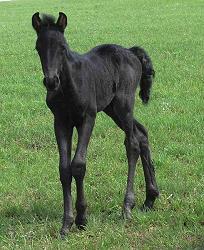 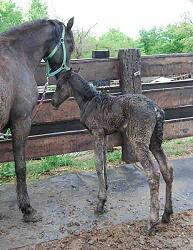 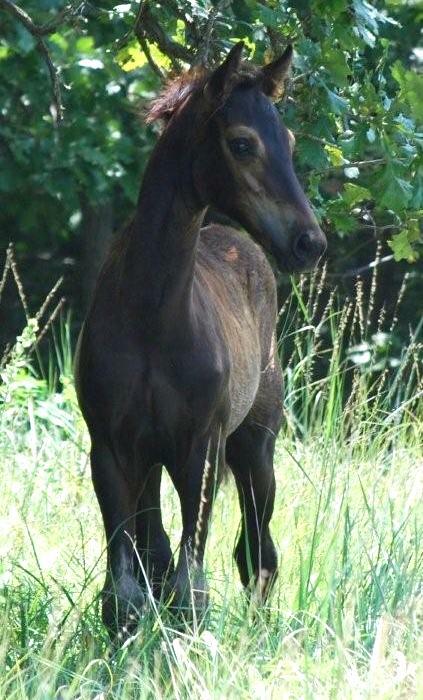 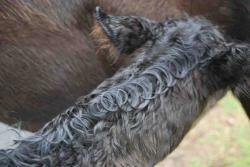 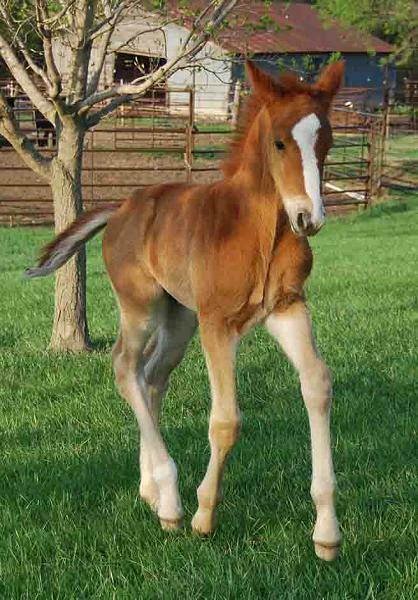 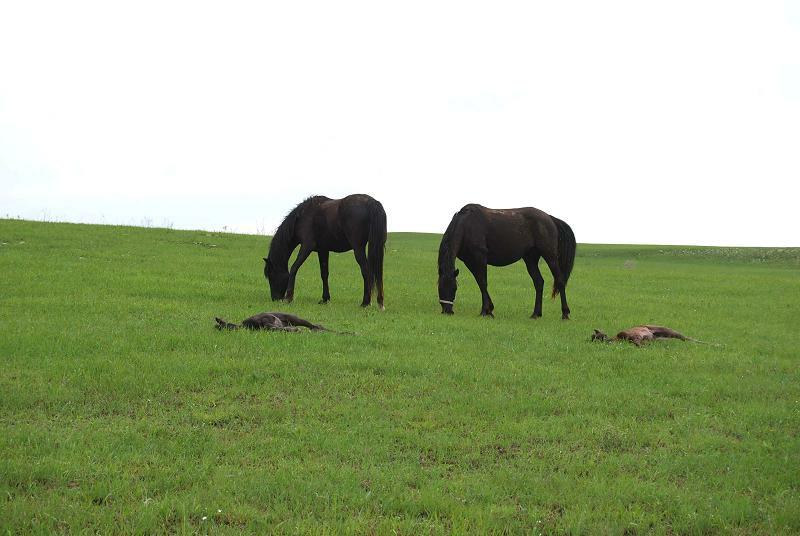 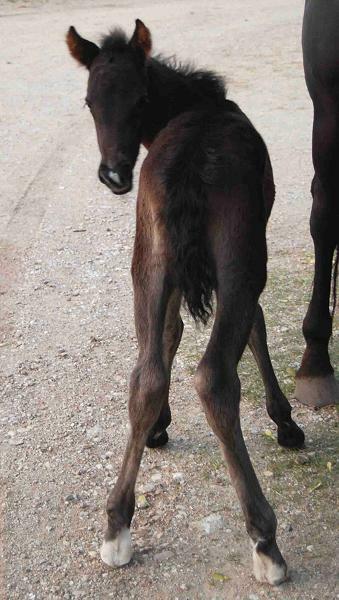 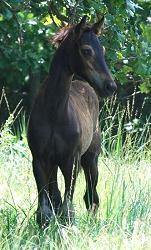 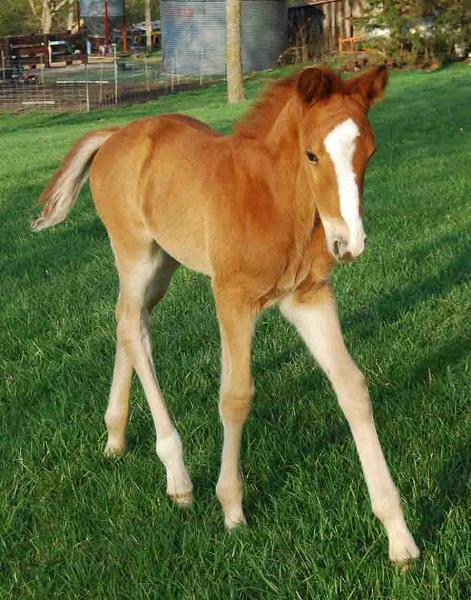 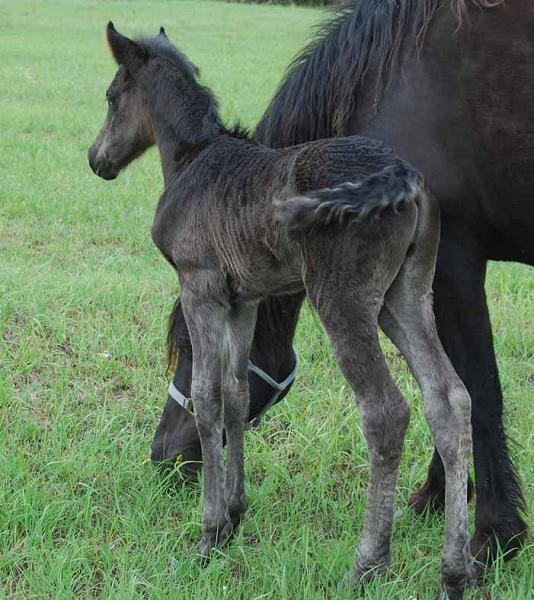 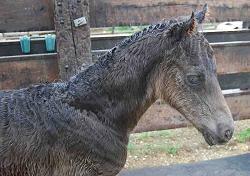 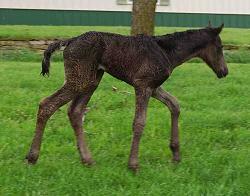 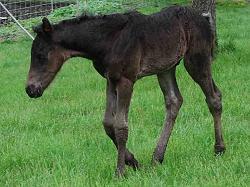 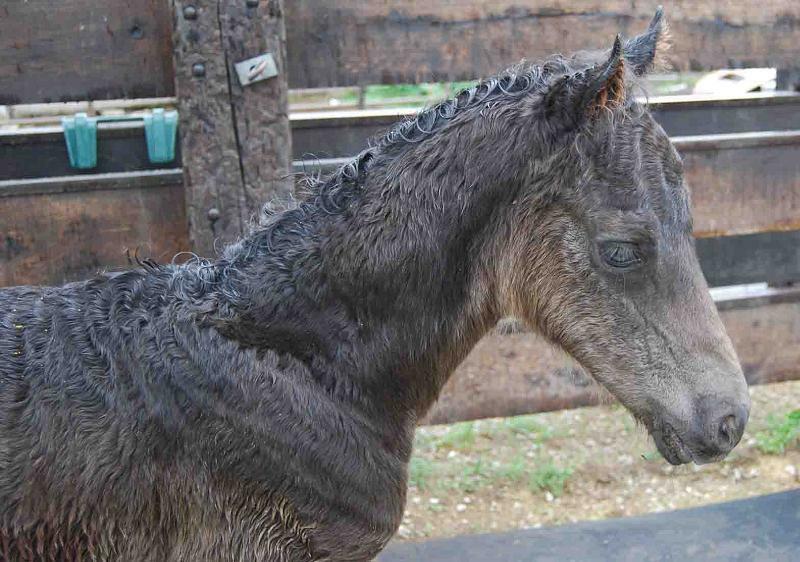 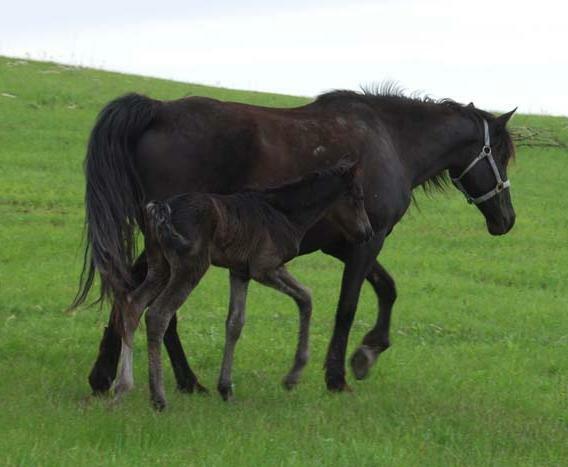 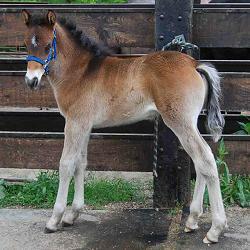 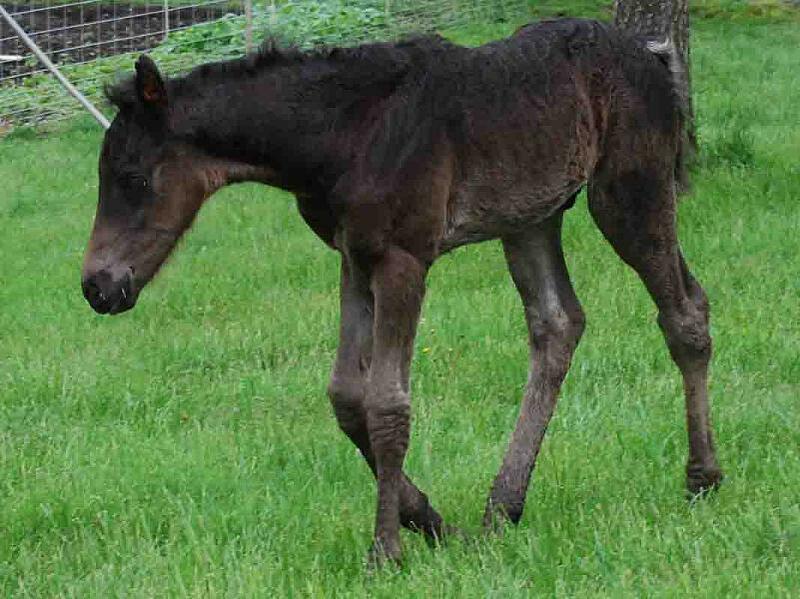 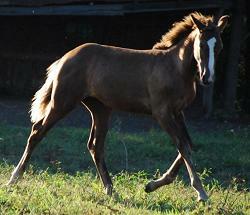 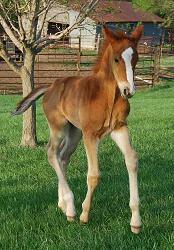 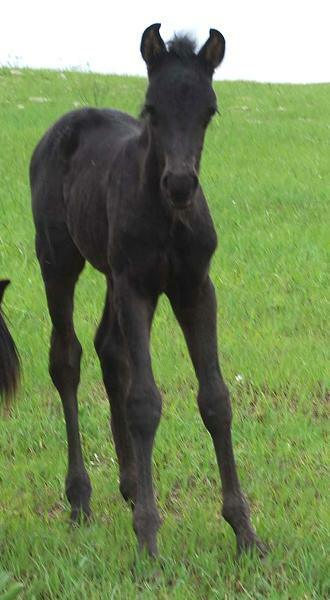 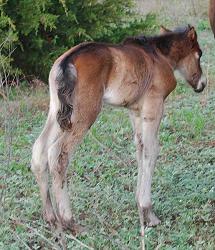 Those allowed closest to the foaling mare are usually siblings through the dam of the new foal. 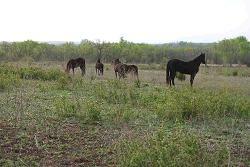 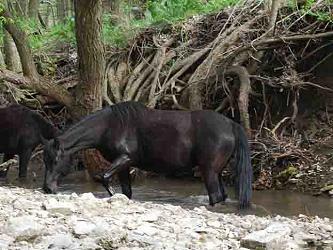 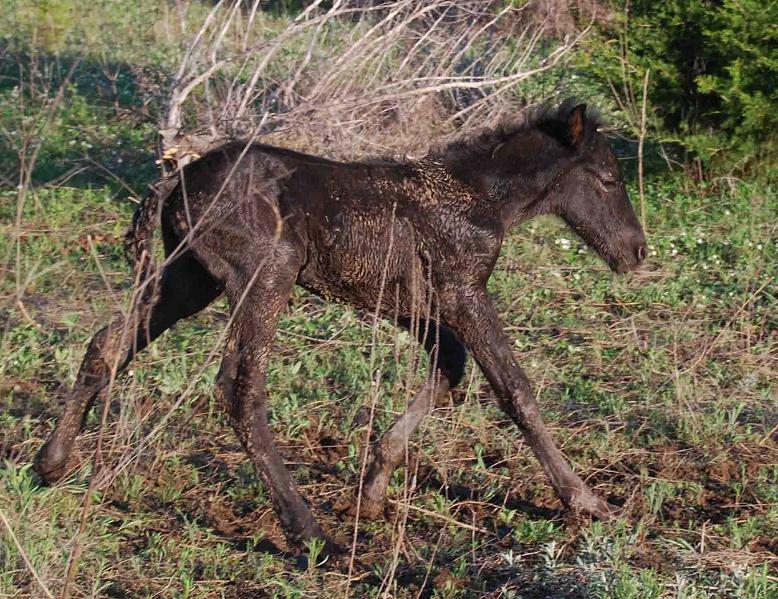 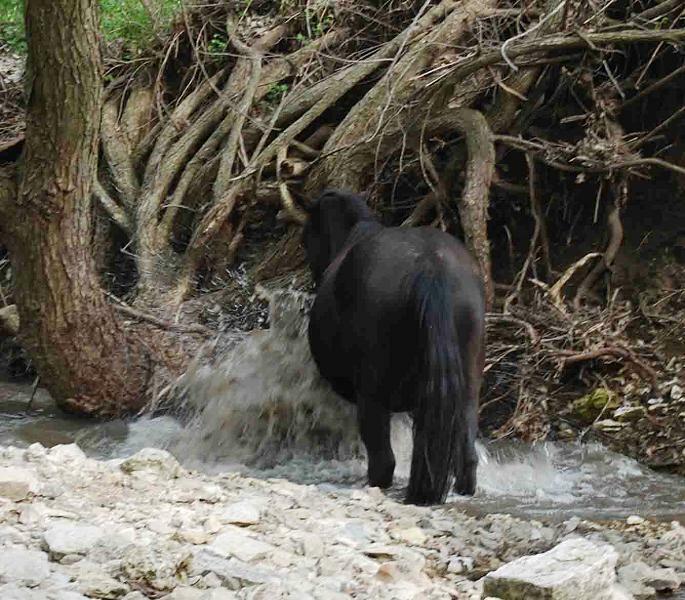 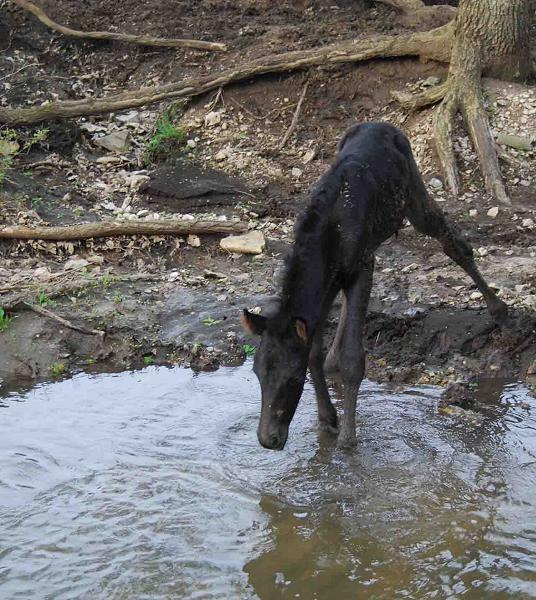 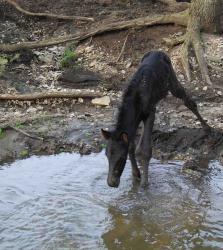 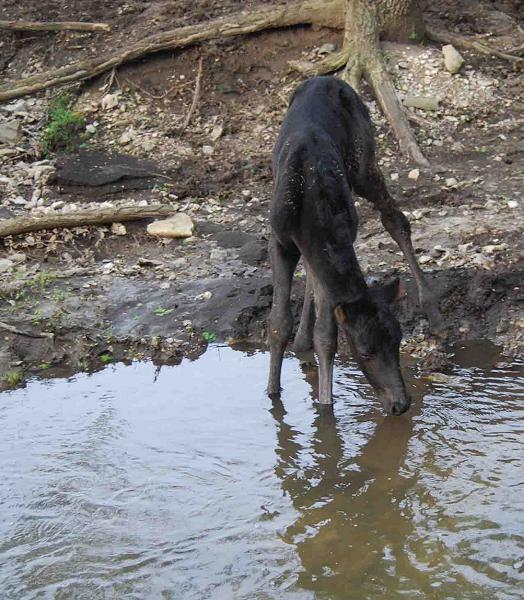 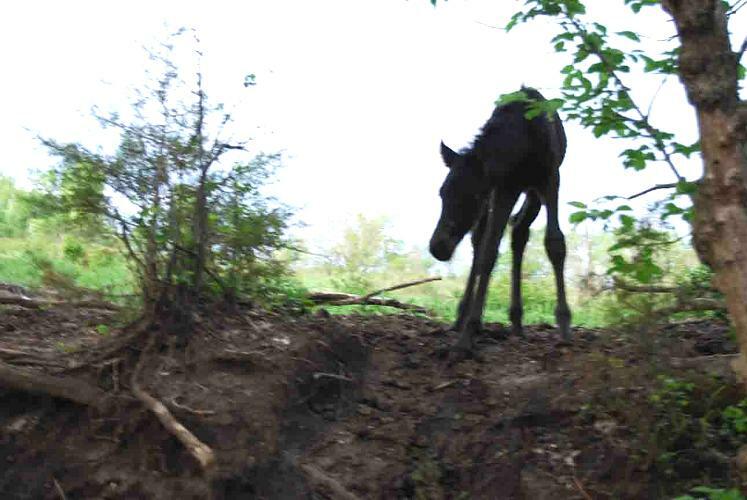 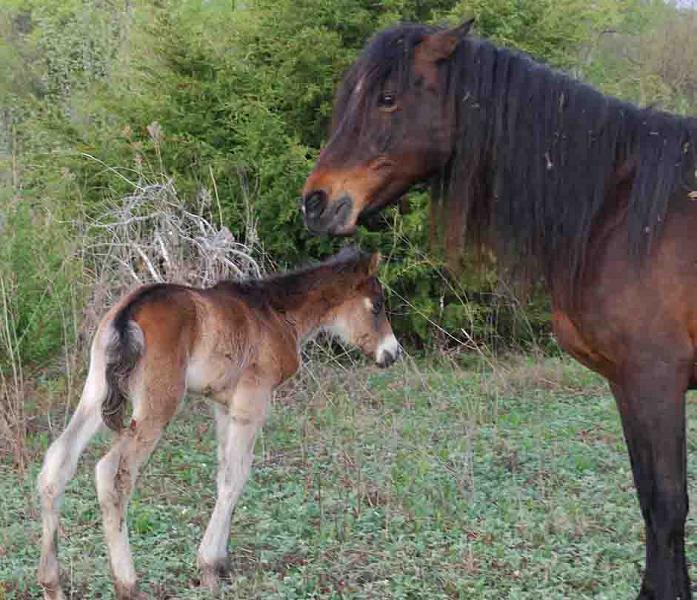 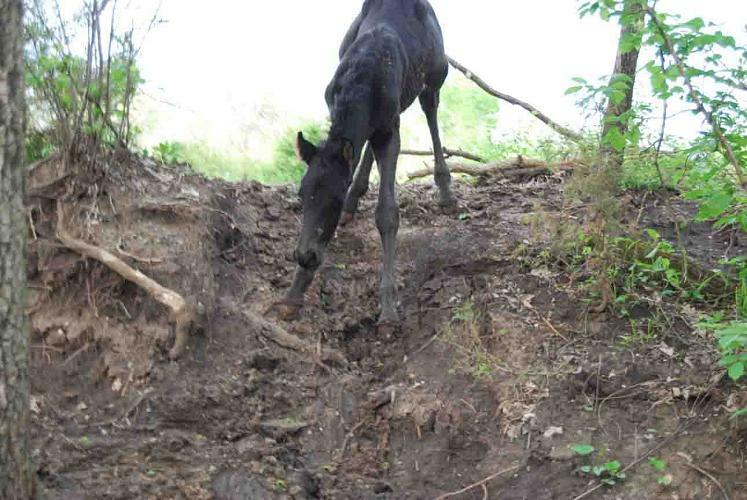 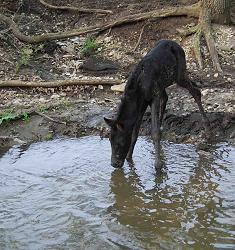 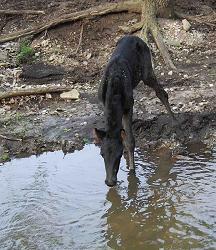 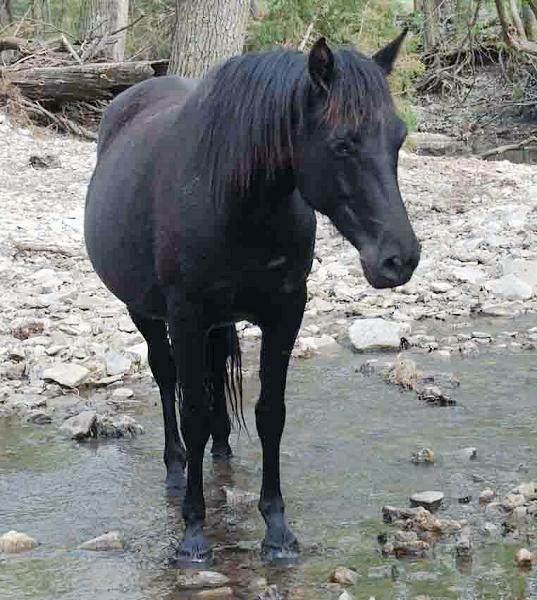 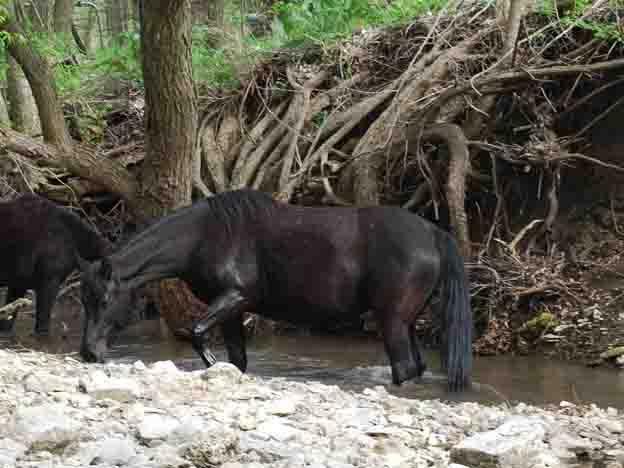 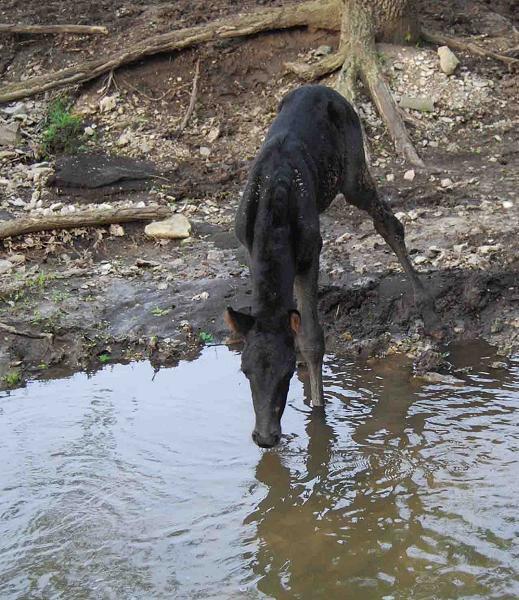 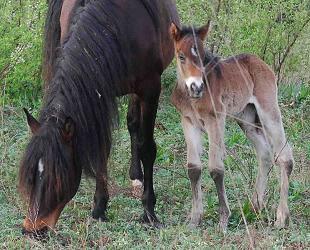 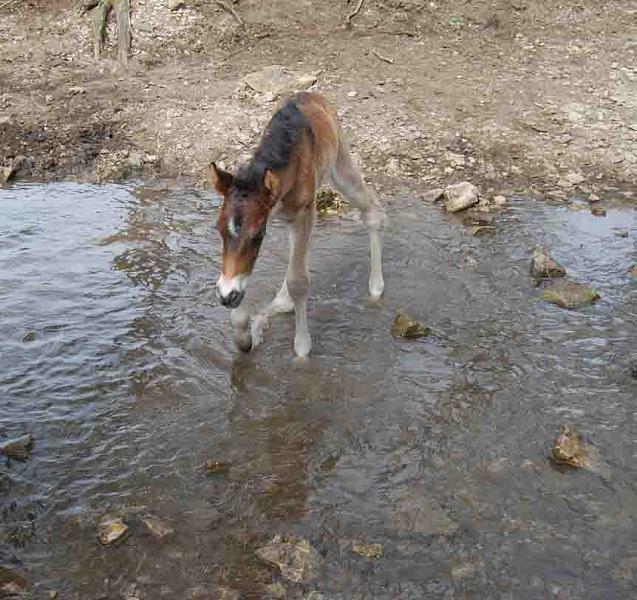 Sometimes the older dams will try to steal foals and the older dams know this. 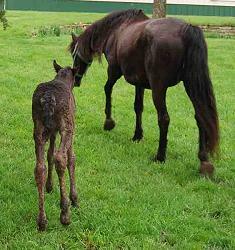 So the foal is guarded closely by the new mother. 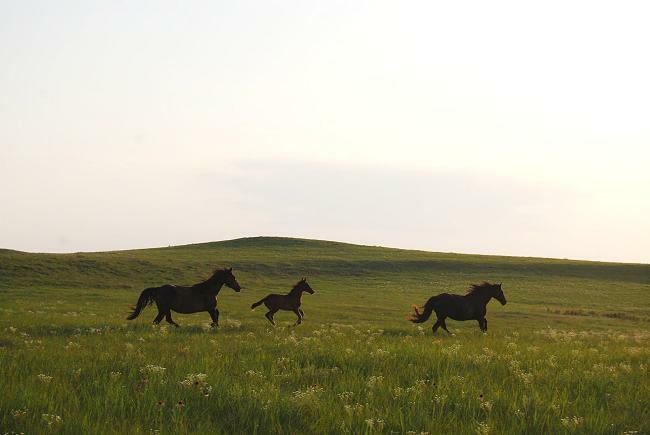 The horses run and dance. 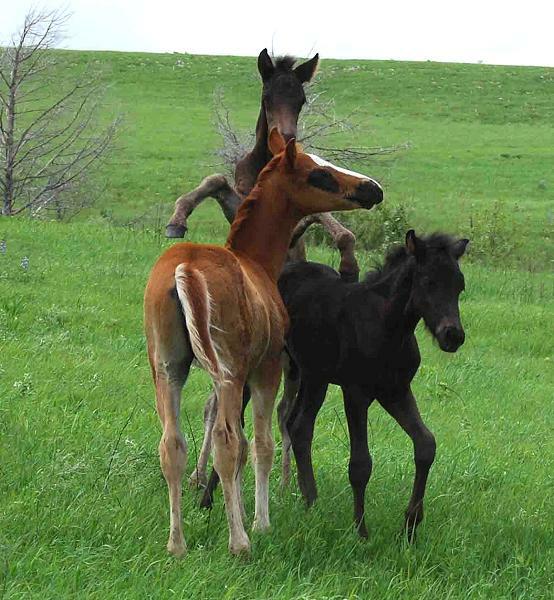 They are filled with the excitement about the birth of a new foal. 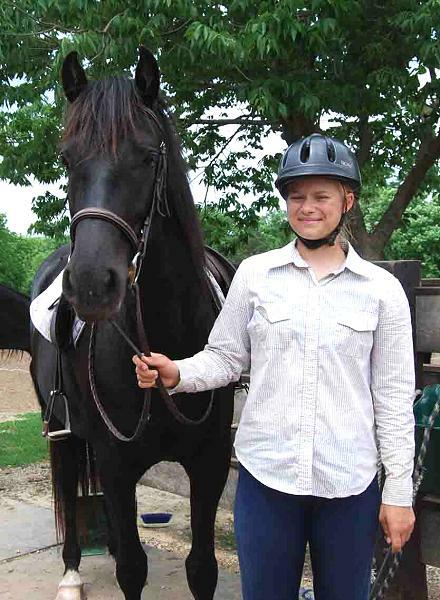 Liberty is excited and displays excitement with a content face and twinkle in her eye. 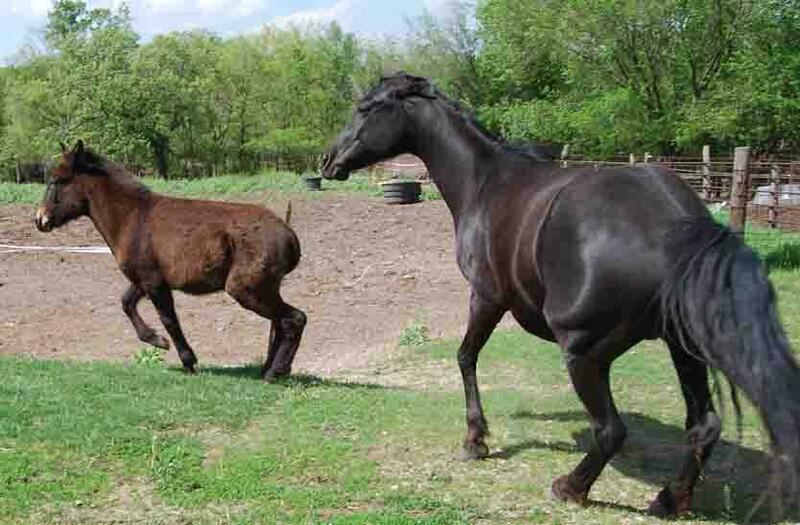 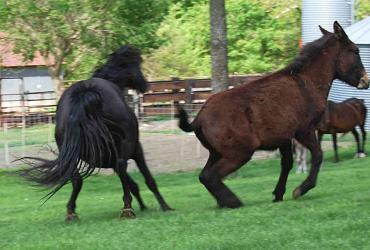 Reagan runs to catch up to his dam and new ½ brother. He will not let them out of is site. 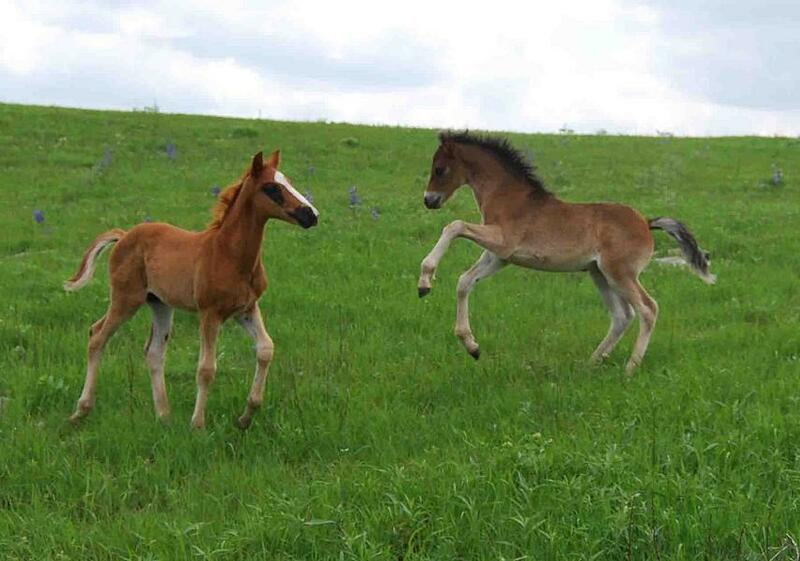 He is very excited about his new brother. Reagan gets to close and Jada warns him of her pending correction if he does not respect her guarded perimeter. The herd settles back down for the evening. Jada and foal are encircled by members of the herd protecting her and the foal from any possible threats or intruders. 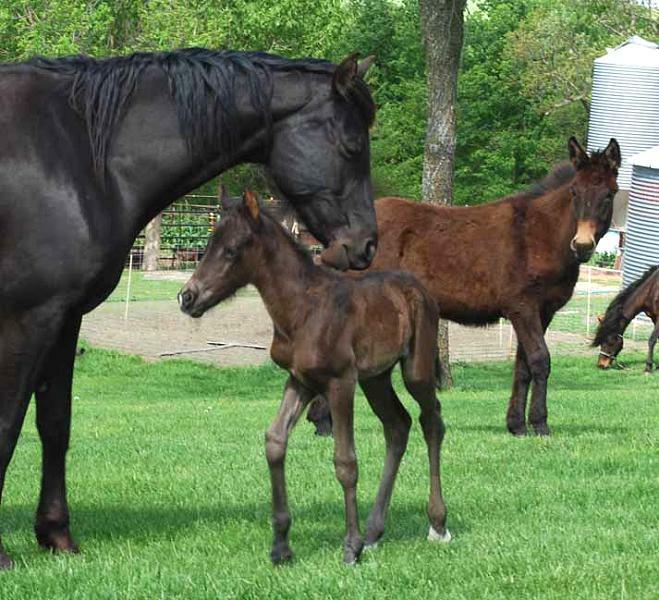 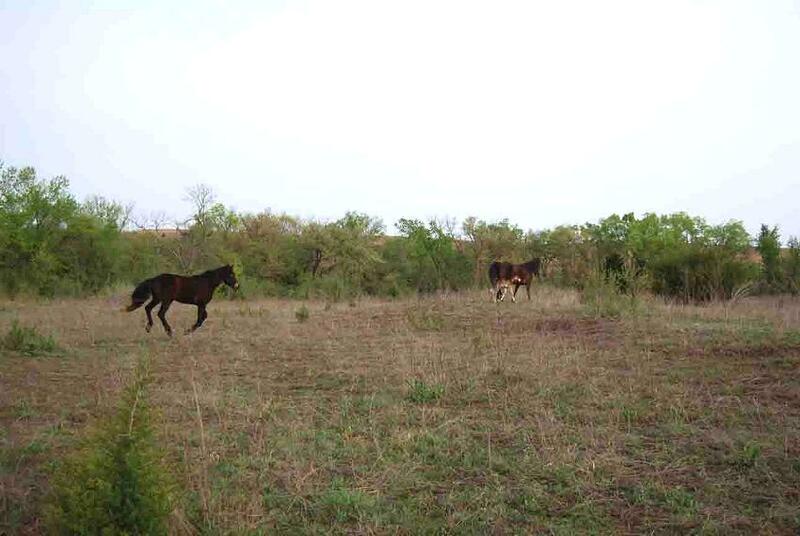 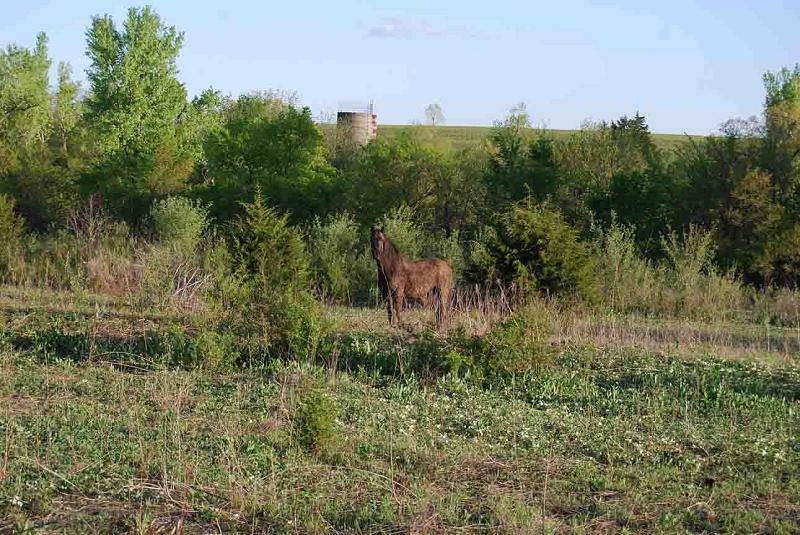 Jada and foal are located in the middle of the circled horses. 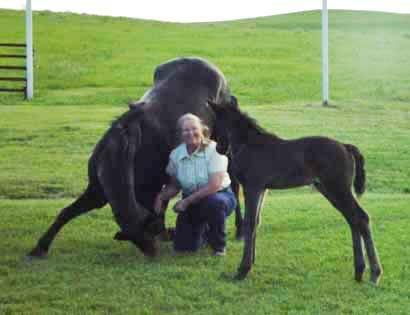 Lacey, dam of Chisholm pictured with Katherine. 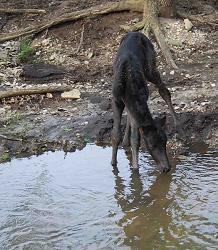 Chisholm has never seen water before. 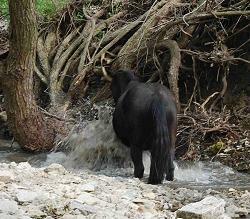 He takes his time and checks out the creek, tastes the water and then decides it is OK to cross. As with all Kansas Bluestem foals these first experiences of life will become a daily occurrence. 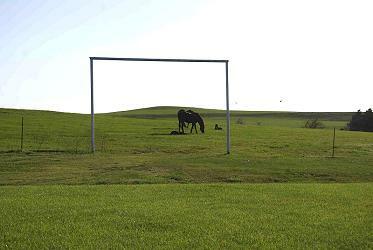 These experiences will be the building blocks for building strong bone, minds and a sure footed, dependable steed. 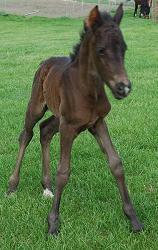 At two days of age Chisholm is now sure footed and fully mobile. 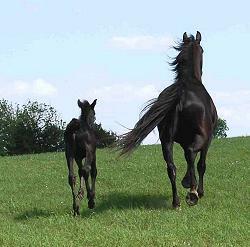 Everyday will lead to new life adventures and experiences. 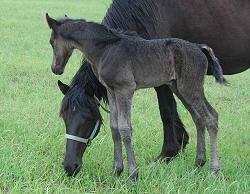 Chisholm pictured with his dam at 6 days of age. 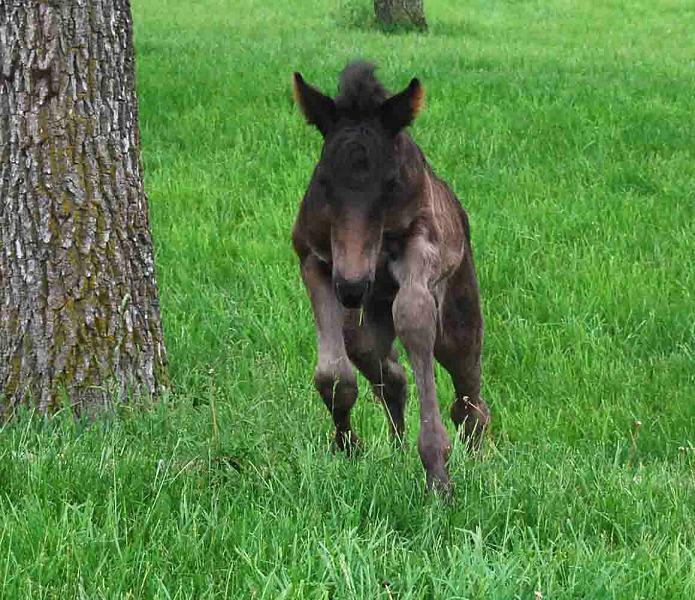 Chisholm is a beautiful colt. He has a very pretty head, hooked ears and a nice long hip. Chisholm 9 days of age. Freedom is my personal riding horse. 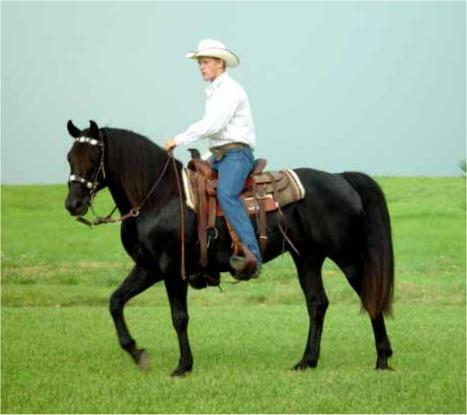 Freedom is very bold and smooth riding. 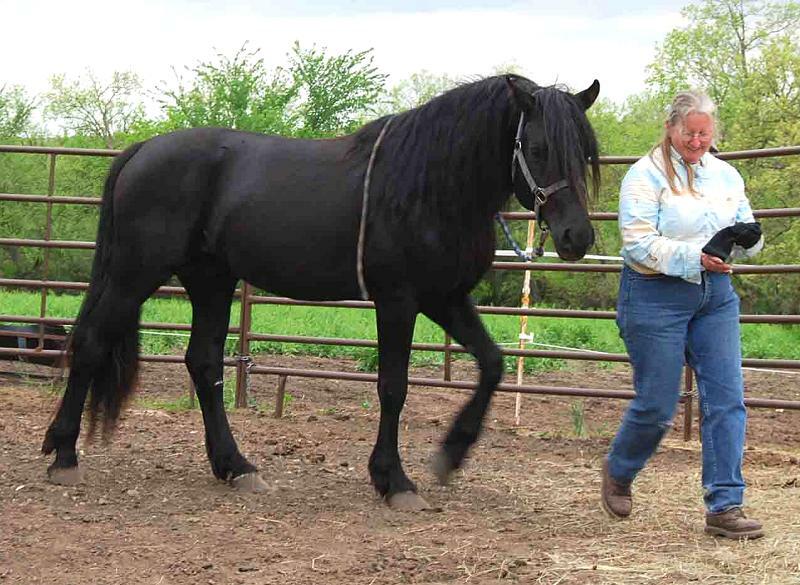 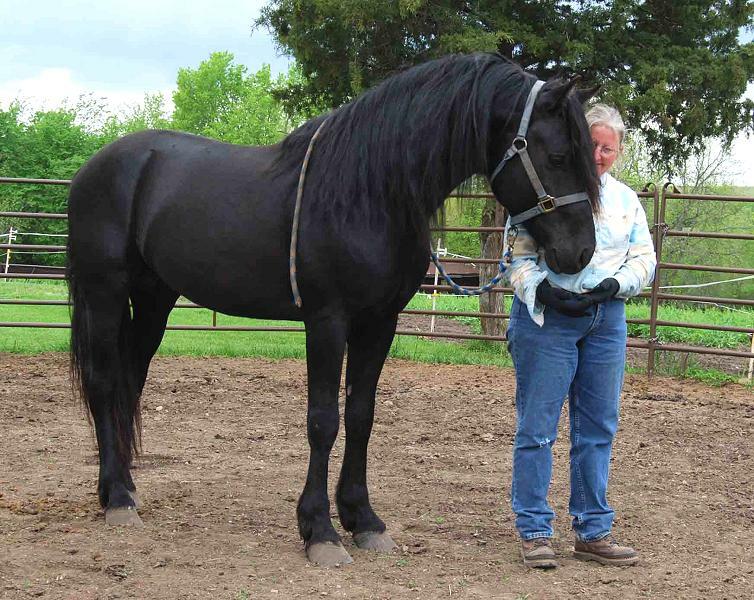 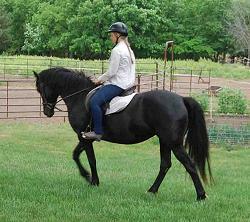 She is not gaited but so smooth you would thing she is. 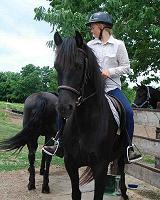 She rides like glass be it canter or trot. 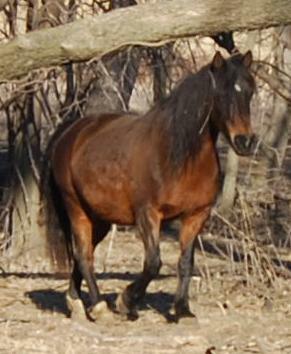 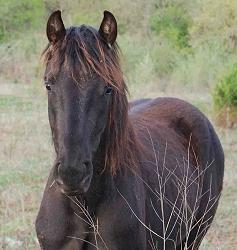 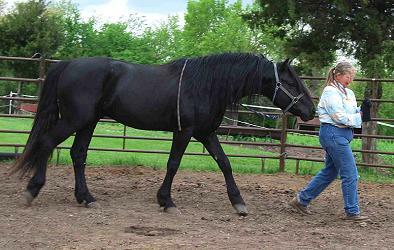 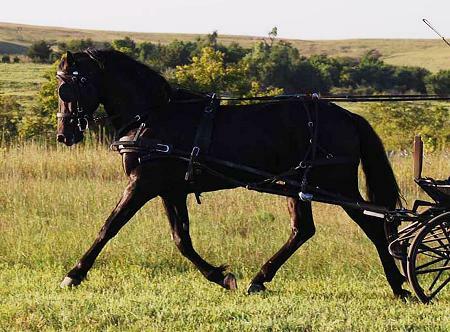 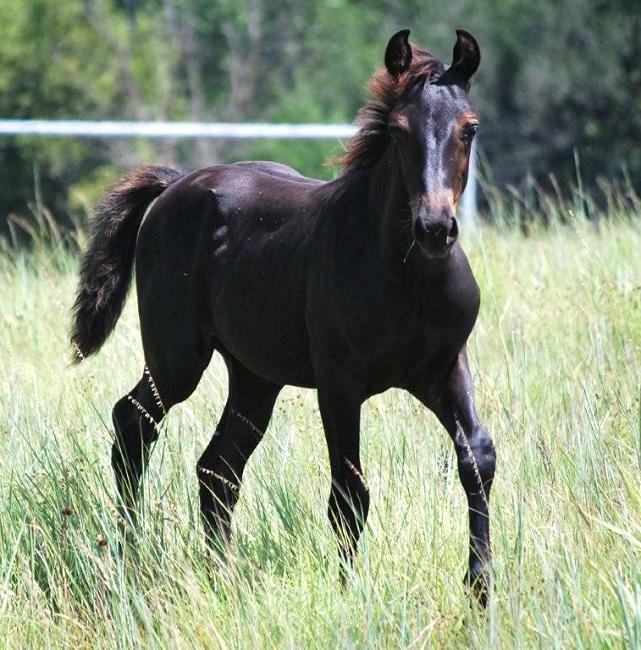 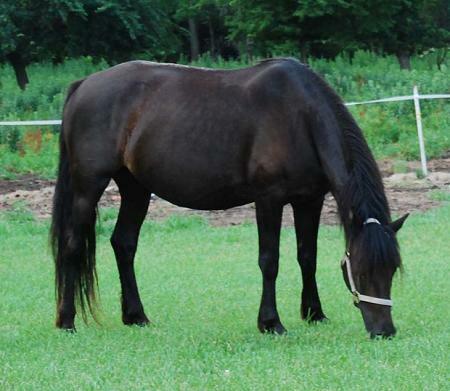 Freedom is pictured at age 4. 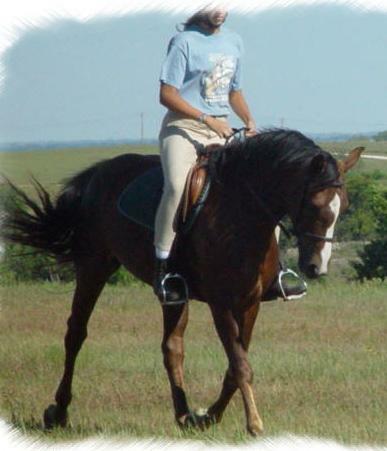 That summer I rode Freedom on the 100 mile Oregon Trail ride and later in the fall took her to her first Competitive Trail Ride. 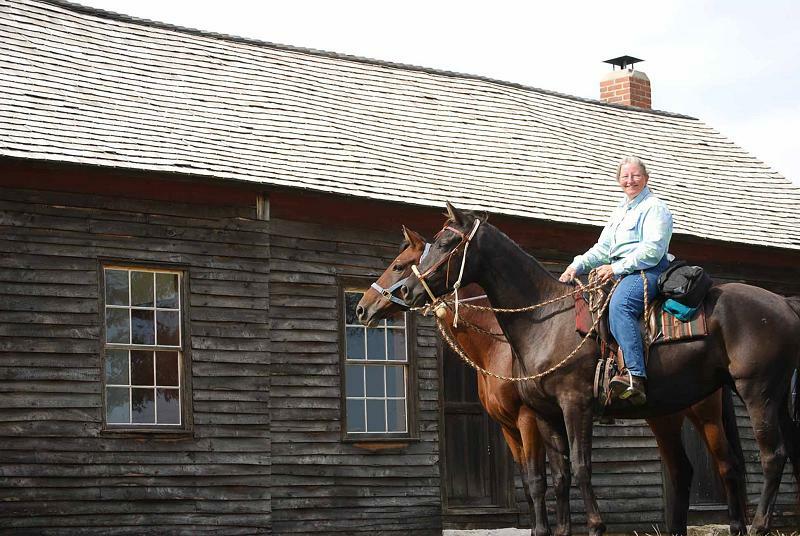 It was her second time off the farm, the Oregon Trail Ride was her first. 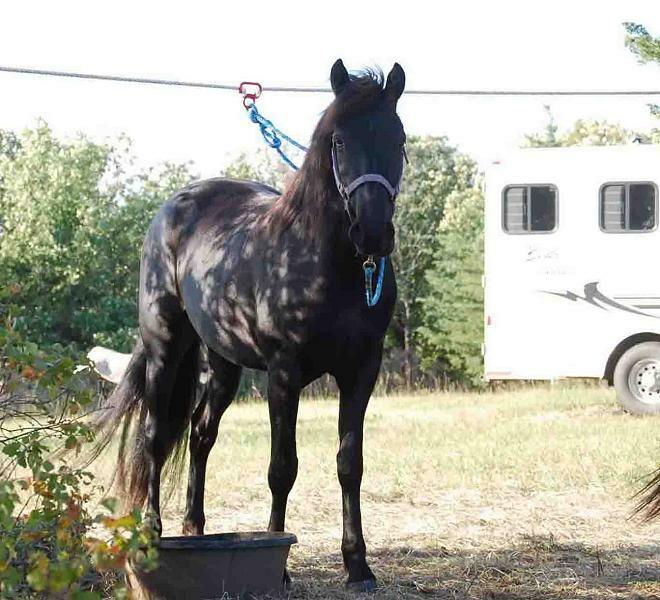 Photos from the CTR show Freedom at veterinary check, tied out and at the end of the ride displaying all of her honors. Freedom just age 4 won her novice division and then won overall novice championship! 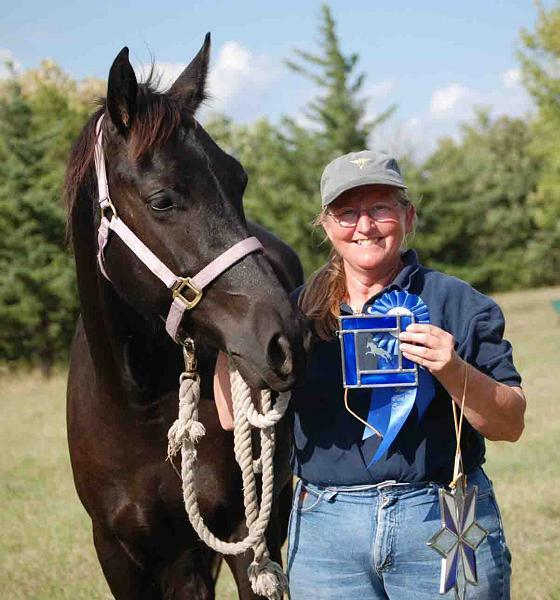 That is quite an honor for a young mare in her very first competition. 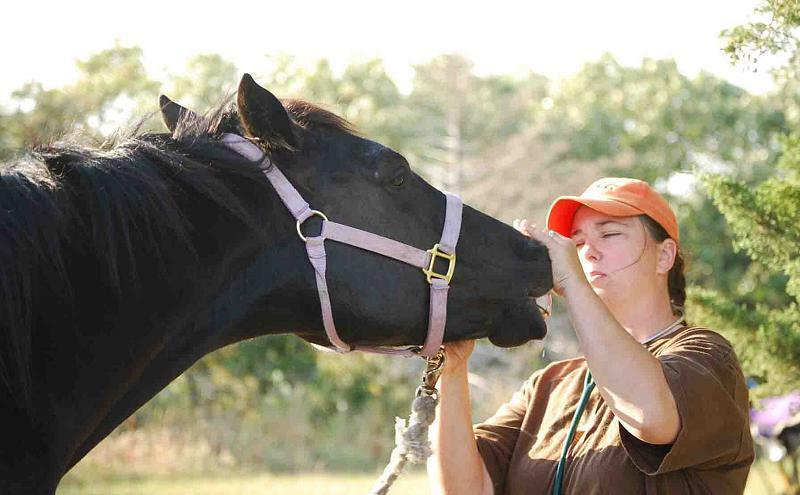 Freedom was competing against seasoned novice riders from all states and all breeds of horses. An event the predominate breed is the Arabian! 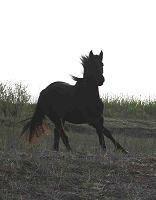 I was so proud of Freedom. Kansas Let Freedom Ring will be destined to follow in her dams footsteps and make her master proud. 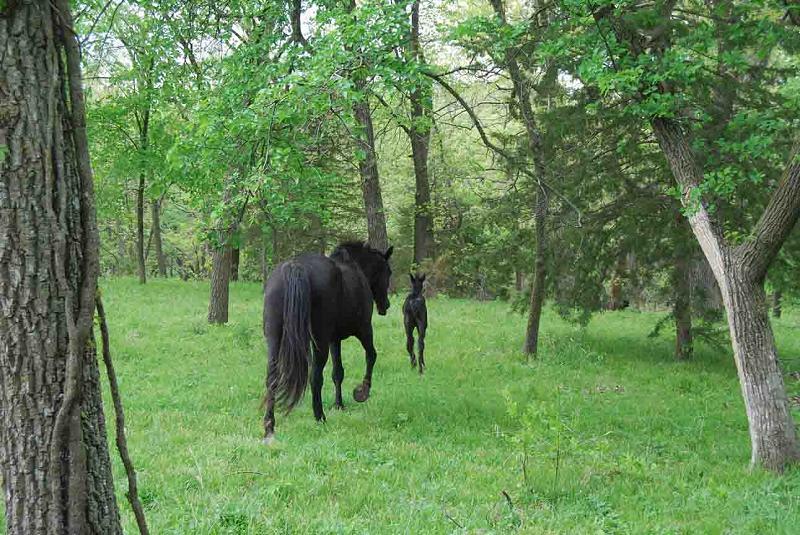 ~ Freedom and sister Lacey tell Willard the mule. 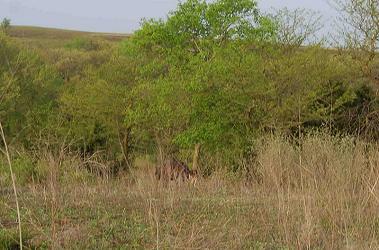 Finally, with a bit of pride and hide missing, Willard looks on at the new arrivals. by using the links below!